I spent some 5.5 hours drawing Jupiter on the night of 16-17 January so that I could make a half-rotation map, and here it is (attached). I was hoping to go on longer, but the clouds arrived and put a stop to observations at around 0314UT. Seeing was around AII-III and there were some lovely details present on the disk. Towards the end of the observation Io was about to transit, its shadow already on the disk. Thanks everyone! It was certainly worth braving 5.5 hours for! 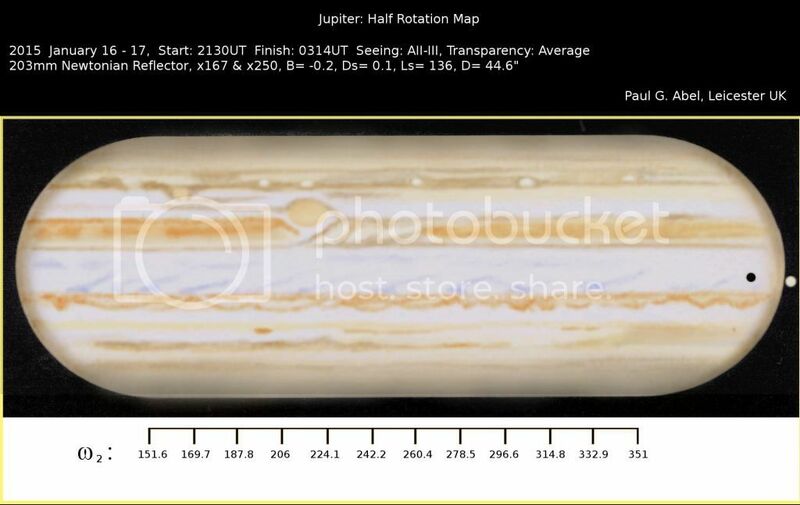 Very nice Half Rotation Map of Jupiter on the night of Jan. 16th & 17th . As always from you, simply amazing. ....very nice.....I havent done strip sketches in ages...!!! Terrific effort and outstanding outcome. I honor your stamina. A good reminder of how rapidly Jupiter turns. More people should try strip sketches--it's a nice way to keep up with the King's rotation. And you can stop at any time. You have some good patience. Very fine work! With my weather I would be froze after about an hour. I always enjoy your strip drawings. Thanks guys! I don't mind admitting that it can be rather tiring doing a long Jupiter run! Paul, WOOW! That is a really nice map showing a lot of Jovian detail. Thank you very much for posting it. An excellent extended disk sketch of Jupiter. This type of recording is a very useful and informative for comparing changes over the atmosphere of Jupiter. Thank you for sharing it with us all. Amazing work Paul. A lot of details on 1 extensive drawing. Just Wow!